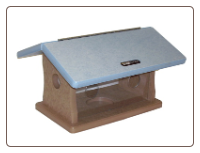 There are lots of groovy dish-type mealworm feeders out there, but as soon as birds discover the tasty morsels, the worms will disappear in no time flat! 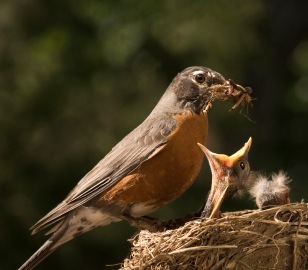 Seems lots of birds love mealworms… especially live ones. If you’re forever running to the store in order to keep your mealworm feeder filled, you may want to consider buying them in bulk. It’s far more economical if you’re feeding live worms. Stored in the fridge, the worms stay in a dormant state until they’re warmed up, so no worries of creepy-crawly things in your fridge! The bedding used is nothing more than wheat bran, purchased at your local grocery store. 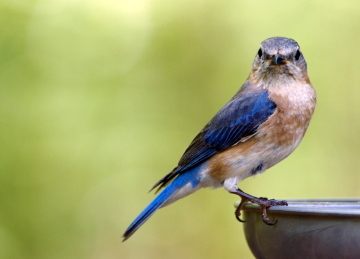 If you’ve been trying to attract bluebirds with no luck…live worms are the ticket! Bluebirds seem to find this precious food source quickly, and will stick around if mealworms are fed on a consistent basis. 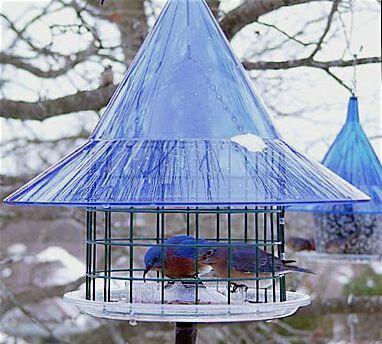 Our bluebirds have braved the tough winters of North Georgia for the past few years now… ever since their mealworm feeder is always stocked with live worms. The heated baths help too, and it’s got to be this combination that has allowed us to witness so many successful broods! Today the post was planned for bat houses, and this Colony bat house accommodates dozens of mature bats and their offspring. 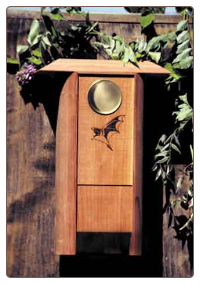 You can control mosquito populations around your yard by inviting little brown bats to take up residence. 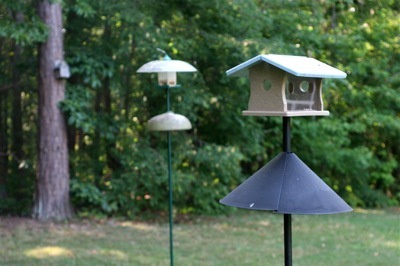 And that’s all for bat houses, because I was more excited about my bluebird fledglings today! For the first time ever, I was lucky enough to witness all four babies inside the mealworm feeder at once. 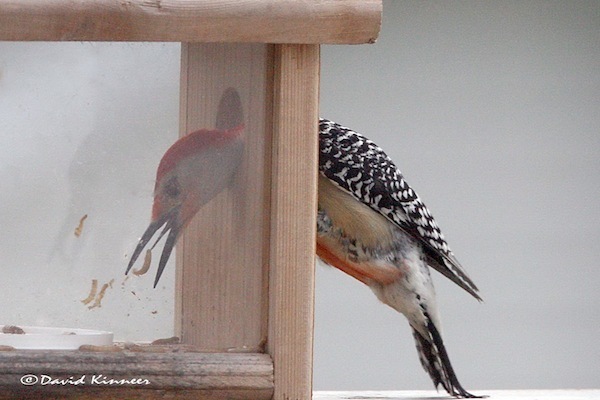 What a rewarding moment, to finally see them enter the feeder themselves and learn to retrieve the worms. We had 2 successful broods this season, with three fledglings and then four. First on the scene was a female baby, and since she was all by herself, it caught my attention. As I went to sit outside with the binoculars, she flew off, but I was able to spot her perching high above in the pine tree. Several minutes went by, and no signs of the family. First thought is always, I hope they’re okay? I went inside to feed the critters, but kept watching out the kitchen window. A juvenile male appeared (from the first brood) and sat on top of the feeder. Then they all came, numbers one, two three and four! The older brother entered the feeder, and a few seconds later a baby male went right in. The other three flew from the nearby shepherds’ hook and sat on top for a few seconds. One by one, they hopped on in! Now there’s five birds inside the feeder, and I’m thinking: “how are they going to get out?” It was very crowded in there! Next came daddy, the adult male landed on he shepherds’ hook as if to say “good job!” Then one by one, just as they had entered, they flew out. It was one of the best sightings this season, and I’m just so sorry that I couldn’t catch it on film, because it was all just so perfect! Versatile enough for year round use, this mealworm dish looks great in any setting. With a vibrant cobalt blue that demands attention, the thick, durable plexi-glass is maintenance free. 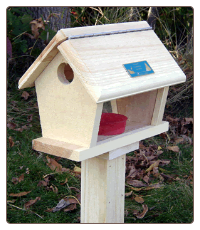 You’ll entice more feathered friends by changing foods according to season, and this one feeder lets you do just that. 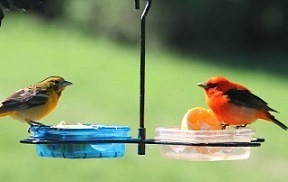 Add jelly in summer months to attract Orioles, grape jelly is their favorite, along with orange halves. 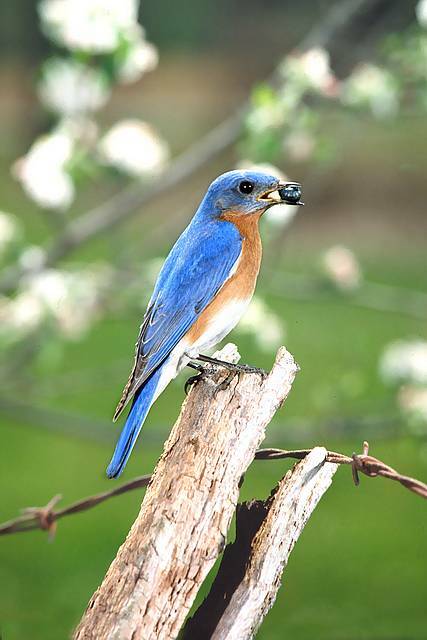 Mealworms in spring to attract Bluebirds – it’s simple with this convenient mealworm dish. In winter months suet may be placed in the dish, or any seed mix you’d like to offer resident birds. The feeder shown is a hanging one, but it’s also available as staked feeder with two dishes, and a pole-mount version with two dishes. Vibrant, and versatile to entice and attract more species for a better backyard birding experience! Not Live nor Dried Mealworms! A great alternative to live mealworms, these worms are packaged to lock in natural juices, keeping them soft and moist for ultimate bluebird attraction. Tastier than dried mealworms, without the hassle or wiggle of live ones. Mealworms were the only food that enticed our bluebirds to feeders. In fact, after a few weeks of constant feeding, they decided to call it home and build their nest. Not one, but two successful broods were raised that spring. 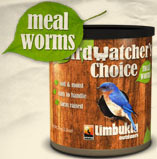 Live Meal Worms for Better Birding! Squeamish about worms in the past, I’ve learned to like them! 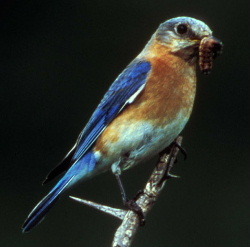 After trying and trying to attract bluebirds, it was the live meal worms that did the trick. Once I started feeding them, the bluebirds were seen everyday. They even decided to take up residence and nest in one of the bluebird houses. Not one, but two successful broods came into being last spring. I was so darn proud! Now, in the dead of winter, with snow in Atlanta, my bluebirds have remained. Three heated birdbaths provide fresh, warm drinking water, and the worms come out every day. I think they’re pretty happy to brave the elements. Feeding live meal worms attracts the most sought-after birds, it’s a sure way to attract song birds and exceptionally brilliant birds like tanagers, robins, orioles, cardinals and goldfinches. After tring everything, I think it is the only way to attract the elusive bluebird! •Get wild birds to feed from your hand!